This painted view of a coastal scene was puzzling on two counts: was the image a view of the entrance to Newhaven harbour, and could more be discovered about William Henry Mason? Art Detectives were asked to find more information about the painting, and the date of the artist’s birth and death. As an initial clue, Museums Sheffield explained they had a note on file: could this work have been exhibited at the Royal Academy in 1877, under the title 'After a Gale – Seaford Bay'? Cliff Thornton traced William Henry Mason’s birth to the fourth quarter of 1838 in Chichester, and his appearance in the 1871 and 1881 censuses as a landscape artist living in Arundel and Hurstpierpoint. He was recorded as ‘living on own means’ in subsequent censuses, and in the 1911 census he was aged 73. Grant Waters confirmed him to be a Sussex artist who moved from Arundel to Malvern Lodge, Westbrooke, Worthing, in the 1880s, and, according to Kelly’s Directory, he still lived at that address in 1905. He exhibited his work at the RA, elsewhere in London, and annually at Brighton Art Gallery in the 1870s and 1880s. His subjects were landscapes, rivers and coastal scenes, mostly of Sussex, but included views of Spithead and one of Cornwall. To confuse matters, Grant discovered another artist called W. H. Mason, who exhibited at the Royal Academy and Dudley Gallery. He lived in the 1880s at Morton, East Retford, Nottinghamshire. A check of RA Exhibitors volumes to 1904 indicates that the full name of the artist was William Henry Mason, while the Sussex W. H. Mason exhibited using his initials. The topography of the painting reminded Grant of Newhaven. Cliff Thornton agreed, and Tim Williams provided proof with a link to an aerial view of the fort. John Covell agreed, and Pieter van der Merwe accepted that the view is of Newhaven and seems likely to be the RA exhibit of 1877 (no.55, ‘After a Gale – Seaford Bay’), but asked for further clarification on the two artists. Cliff Thornton confirmed that William Henry Mason (1847–1936) was brought up at Eaton Hall, East Retford, son of a wealthy landowner and magistrate. He became a barrister and moved into Morton Hall with his father, which he inherited, and died there in 1936 aged 90. Osmund Bullock found proof that the Sussex-based William Henry Mason died on 13 January 1929, plus details of the inheritors of his estate and of his father. 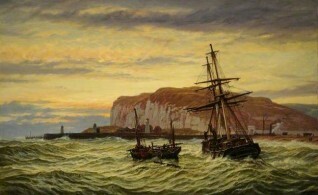 Pieter van der Merwe accepted all the findings and indicated the painting should be reunited with its true title ‘After a Gale – Seaford Bay’, with a note that the scene depicts Sussex, looking towards Newhaven, and was exhibited at the Royal Academy in 1877 by William Henry Mason (1838–1929) of Chichester, a costal marine painter. The younger but contemporary William Henry Mason (1847–1936) is identified as a barrister and landscape painter of East Retford, Nottinghamshire. Museums Sheffield were able to update their records, and the PCF were able to add a birth and death date to the artist record for William Henry Mason (1838–1929). Editor's note: changes mentioned in this article will not appear on the Your Paintings website until January 2016. Was this 'Coast Scene with Shipping' exhibited in 1877 as a view of Seaford Bay?